Diamonds sparkle, but can also cut. So it is with David Hoyle's newish show, created last year, which charts the past sixty years of gay liberation and resistance. 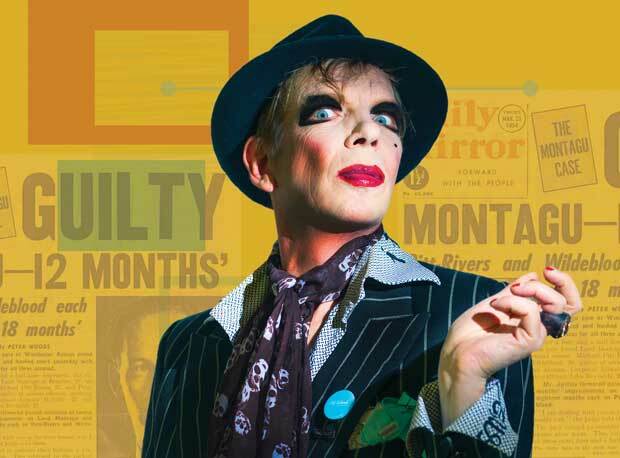 Part audacious raconteur, part self-help guru, Hoyle is righteous rather than self-righteous: describing himself as sexually 'amorphous', the legendary chiffon-clad,smudged kohl wearing performer weaves in and out of the audience dispensing advice and sardonic quips.He is pithy and fiery, yet lovable. But in celebrating the massive strides made in tems of LGBT+ equality, Hoyle simultaneously acknowledges how much work there is still to do, with homosexuality still illegal in seventy four countries. Hoyle's acidic humour is affectionately rooted in the minutiae of Britain – from his troubled youth in Blackpool, through working in BHS, subsisting in the eighties on 'amphetamines and Complan', to the rise and fall of his iconic character The Divine David. His is an anger fuelled by the discrimination of Margaret Thatcher – while she was clamping down on gay rights, she was hypocritically hanging out with Jimmy Savile. He suggests little has changed in our current political climate, as the alt-right make gains globally. Providing some campy interludes during Hoyle's many costume changes are the wonderfully chaotic LipSinkers, a drag quartet. Each member seems to represent a potted history of drag, from the traditional pantomimesque to a postmodern layering of gender identities. It's truly gratifying to see a queering of the Madchester lad culture, through a cheeky striptease, or a gay reclamation of the hippie musical Hair. Augmented by Barbara Kreuger style slogans projected onto a screen, this anti-nostalgia show, with a glorious soundtrack – including tracks from Frankie Knuckles, Prokofiev and Bowie – is a romp into Hoyle's past, but also a sobering look at how capitalism has failed so many, particularly excluded others from poorer backgrounds. Diamond is purposeful and playful, personal and profoundly political: oppositional, bold and beautiful. Tron Theatre, Glasgow part of Take Me Somewhere. A festival of contemporary performance, taking place across Glasgow and building on the legacy of the arts programme at the city's late but legendary venue, The Arches. Take Me Somewhere features events created through a programme of artistic development opportunities as well as inspirational work from beyond Scotland. An unforgiving queer performance of sexuality and British culture exploring LGBT history from 1957 to 2017 through the personal biography of avant garde performer David Hoyle.